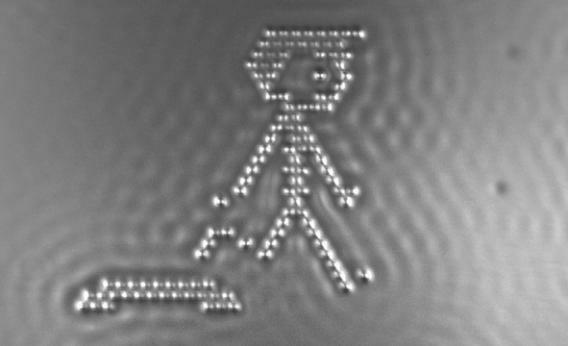 IBM uses atoms to create world's smallest movie. © IBM Research. All rights reserved. In a secret laboratory, a team of scientists races against the clock. They hover over a 2-ton machine so menacing and powerful, it can freeze single atoms in place. With the precision of angels and the patience of gods, the scientists use a super-sharp needle to coax these specks of matter into complex patterns—patterns they hope will communicate to the children of Earth a message so urgent, the fate of the human race depends on it. At least, that’s what the voiceover might say if this were a feature film. But this is Silicon Valley, not Hollywood, and the film is a 94-second stop-motion reel designed to show kids (and everyone else) that science is awesome as cuss. For the last few weeks, a team at IBM has nudged atoms—building blocks of the freaking universe—into slides depicting a short story about a boy and his pet. It took hundreds of these frames to make the movie you see here. The scientists have experimented with iron, manganese, cobalt, and other various atoms to learn how they react at atomic levels, but they chose a carbon monoxide molecule for the film. Of course, I had to ask the director what he saw in this young star, what separated it from all the other casting couch hopefuls. The interesting properties IBM is immediately interested in have to do with data storage. In accordance with Moore’s law, our ability to cram more and more technology into tighter spaces has grown exponentially, and scientists are always looking for the next way to innovate. But instead of looking to make existing technology smaller, Narayan and his team wanted to find the limits at which such technology can begin to exist. Now let’s put “12 atoms” in terms the rest of us can understand. If data storage could be perfected at this level, it would mean you could keep every Nic Cage movie ever made in a device the size of a fingernail. Oh, and that’s in addition to every other movie in the history of film. This sort of thinking is invaluable, and we need more of it. Especially if it means arranging atoms into Vulcan gang signs. Because that also just happened.